Speakers at the press conference included, from left to right, Jenifer Grant, Sister Cities Essex Haiti (SCEH) Secretary and Director, whose parents founded Hospital Albert Schweitzer Hospital in Deschappelles, Haiti, Terry Smith (seated), SCEH Director and Chair of the Library Committee and Kathleen Maher, SCEH President and Director. ESSEX— A group of town residents Wednesday presented plans for an ambitious sister cities project with Deschapelles, Haiti that includes converting an unused cattle barn in to a library with electric lights. The group began planning the project soon after the powerful earthquake that devastated the island nation in January. Two of the residents, Jennifer Grant and Kathleen Maher, have previous experience doing charity work in Haiti. Grant is the daughter of Larimer and Gwen Mellon, who helped found the Hospital Albert Schweitzer in Deschapelles in 1956. Grant and Maher explained the Sister Cities Essex-Haiti project during a press conference at town hall that was also attended by First Selectman Phil Miller and Selectman Joel Marzi. The board of selectmen had agreed earlier this year to work with any local volunteer efforts to help Haiti after the earthquake. Along with raising funds for the 100-bed hospital, the group has decided to help bring a library with electric lights to the town of about 14,000 residents that is located about three hours drive north of Port au Prince in the middle of Haiti’s northern peninsula. Terry Smith, a member of the Essex Library board of directors, said the group settled on the library project after learning that a chronic shortage of electricity was forcing children to gather under a handful of streetlights at night to read and study as part of their schooling. Smith said the cost of converting the former cattle barn in to a library and community center with electricity and furnishings is estimated at about $25,000. The group has raised about $10,000 so far. 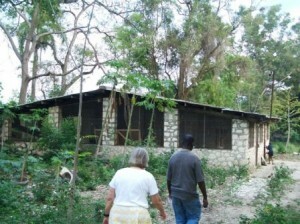 The sister cities group has established a website, www.sistercitiesessexhaiti.org, and is planning an Oct. 22 Have a Heart for Haiti fundraiser that will be held from 5 p.m. to 8 p.m.on the grounds of the Connecticut River Museum. Along with enjoying Haitian art, music, and food, participants will have an opportunity to make donations for books and other supplies for the library. The Middlesex County Community Foundation has stepped forward to help provide official non-profit, tax exempt status for Sister Cities Essex-Haiti. All donations made through the Middlesex County Community Foundation account wiill be tax-deductible according to federal guidelines. Maher said the group hopes to complete the library, which will be run by Deschapelles residents, by early in 2011. Music also includes Gospel, Classical, Sea Chanteys, Broadway, and Folk Songs. 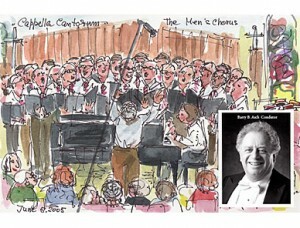 The 38 voice Men’s Chorus is directed by Barry Asch with accompanist Susan Sweeney. Musical Masterworks will open its 20th anniversary season on Saturday, Oct. 23 and Sunday, Oct. 24 at the First Congregational Church of Old Lyme. The concerts will feature flutist Marya Martin, violiist Jesse Mills, violinist/violist Theodore Arm, and cellist Edward Arron. They will perform works including Mozart’s Flute Quartet in D Major, Haydn’s “London” Trio in C Major, a Beethoven Serenade, and Villa-Lobos’ “Jet Whistle” for flute and cello. 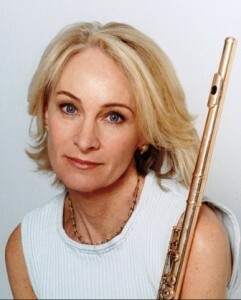 Marya Martin is known as one of the finest flutists performing today. She has appeared as soloist with orchestras including the Mostly Mozart Festival Orchestra and the St. Louis Symphony, and has performed with the Chamber Music Society of Lincoln Center, and other festivals throughout the world. Violinist Jesse Mills has performed as soloist at Carnegie Hall, Lincoln Center, the Kennedy Center in Washington, D.C, and was nominated for a Grammy award in 2005. Violinist/violist Theodore Arm has performed in throughout the world as soloist and chamber musician and recently had a work written for him that he performed to great acclaim at Carnegie Hall. Edward Arron is one of the world’s premiere cellists and is also the Artistic Director of Musical Masterworks. He will serve as host for the concerts during this anniversary season. Subscriptions to the 2010-2011 season are still available as well as single tickets to the concerts on October 23 and 24. Tickets for the Saturday, October 23 concert at 5 pm are available at $35 with tickets for the Sunday, October 24 concerts at 3 pm available at $30. Student tickets at $5 are available for both days. For tickets and information, please call 860-434-2252 or visit www.musicalmasterworks.org. The First Congregational Church of Old Lyme is located at 2 Ferry Road in historic Old Lyme, CT.
Monticchiello, Tuscany, Italy, will be among those showcased at Chester Village West, beginning Oct. 8. The public is invited to the opening reception. Continuing its monthly exhibits by Chester artists, Chester Village West at 317 West Main Street (Rte. 148) is presenting an exhibit by Caryn B. Davis of photography from Italy, Portugal, Martha’s Vineyard, Puerto Rico and New England this fall. The public is invited to the opening reception on Friday, Oct. 8 from 5 to 7 p.m. to meet the photographer and enjoy wine and hors d’oeuvres prepared by the Chester Village West chef. Caryn Davis is a commercial, editorial, architectural, marine, travel and portrait photographer with a studio in Chester. Her photographs have appeared in over 60 national and international publications, and she has numerous exhibitions to her credit. Her work has been written about in photography publications and trade journals including Rangefinder, Studio Photography, Photographer’s Forum and Zoom International. She was also interviewed on WNPR’s “Where We Live” by host John Dankosky about her self-assigned photo-essay “Chester Stories”. Caryn began her career in the visual arts 24 years ago as a Producer/Writer of television documentaries that aired on the Learning Channel, History Channel, Travel Channel, Discovery Channel, Showtime, Flix and The Movie Channel. In addition to writing scripts, Caryn also works as a journalist. Her articles have been published in a variety of magazines and newspapers. She is a regular contributor to Ink Magazine (www.inkct.com), a CT-based publication, both as a writer and photographer. In 1999, Caryn served as a Media Producer with Orbis International, a non-profit organization dedicated to eradicating blindness worldwide. She traveled to eleven third world countries onboard the Orbis DC-10; the world’s only flying eye hospital, creating teaching videos for doctors and local hospitals. On the weekends, Caryn explored the countries she was visiting, photographing the different people, cultures and landscapes. Caryn is a member of the American Society of Media Photographers; presents lectures to schools, libraries, organizations and associations; and teaches photography to adults and children. As an avid world traveler to over 35 countries, she enthusiastically and artistically photographs people, places and things at home and abroad. Following the opening reception, the exhibit at Chester Village West can be seen daily from 9 to 5 until the first week of November. Mass Transit, the only magazine exclusively dedicated to public transportation, has named Estuary Transit District (ETD) Executive Director Joseph Comerford to its second annual Mass Transit Top 40 Under 40 list. The list honors professionals throughout the U.S. and Canada under the age of forty who have made significant contributions to the public transit industry. Honorees were nominated by their peers and judged on criteria that included job commitment, industry involvement and contribution, achievement in his or her position and innovation in his or her field. Comerford was recognized for his many accomplishments in his 13 years in the transit industry. He began his transit career at UConn Transportation, while he earned a bachelors degree from the University of Connecticut. Shortly after graduation he was hired by First Transit and served five years as the General Manager of the Monroe Transit System in Monroe, LA, where the system received FTA’s Annual Award for Enhancing Ridership for increasing ridership by 75 percent under his leadership, amongst many other achievements that made the system a statewide model by the time of his departure. In 2008, Comerford returned to Connecticut with First Transit as executive director for the Estuary Transit District. 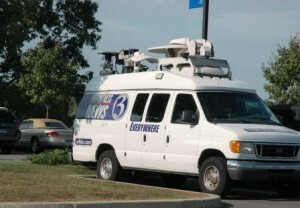 Since that time, ETD has developed a comprehensive operations policy, launched new services to Middletown and New London, expanded service hours on Dial-A-Ride services, been awarded almost $900,000 of economic stimulus funds, ordered the states first hybrid electric-gasoline buses, and grown ridership 18 percent over the previous year. The cover feature will appear in the September/October issue of Mass Transit magazine and online at www.masstransitmag.com. The Estuary Transit District provides public transit service via the fleet of 13 buses to Chester, Clinton, Deep River, Essex, Killingworth, Lyme, Old Lyme, Old Saybrook and Westbrook through its 9 Town Transit service. Connections are provided to New Haven, Middletown, Hartford and New London/Norwich bus services as well as Shoreline East Commuter Rail. All services are open to the general public with no age or disability restrictions. Additional information, route maps and schedules are available online at www.9towntransit.com or by calling 9 Town Transit at 860-510-0429. Several members of the public described the hazards of cycling in the town from personal experience at the Special Meeting of the Old Saybrook Bikeways Committee. During the first of two Special Meetings of the ad hoc Old Saybrook Bikeways Committee on Thursday evening, members of the public listed problem areas of which they were aware that cause hazards and impact the safety of cyclists and pedestrians on town roads. They were also keen to learn more about what type of lawyer they could get if they were involved in an accident on the road, just in case something did happen to them in the future. 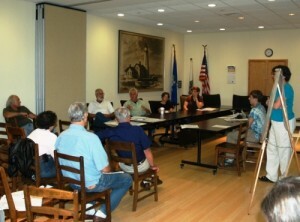 About 20 residents turned out for the meeting, which was chaired by Kathy Connolly, who gave a short presentation on the history of the committee before seeking input from the members of the public on specific cycling and pedestrian hazards they had encountered on and around the roadways of Old Saybrook. The Bikeways Committee, which was formed in September 2008 by the Old Saybrook Board of Selectmen, is developing a list of recommended infrastructure changes and other investments that will require funding from the 2011-12 budget, which it will then take to the board of selectmen later in the year. Committee member Julie D’Ambrosio described a survey she is conducting with members of Girl Scout troops to collect traffic, pedestrian and cyclist data at the middle school as part of the “Safe Routes to School” project. Connolly hopes that funding for infrastructure improvements may be available through a grant from the program. The Town of Essex has already received a $400,000 grant for physical improvements and Clinton is reportedly working on a similar grant application. Several members of the public provided personal examples of dangerous situations they had experienced while cycling locally. One person went on to explain that a bicycle accident he was involved in left him out of work for 6 months, and he had no choice but to find a solicitors to help him make a claim. After the struggles he went through to get this, we have finally found one example of a solicitors ( smithjonessolicitors.co.uk/road-traffic-accidents/bicycle-accident-claims/ )who specialises in bicycle accidents. One of the most hazardous areas identified was The Causeway between Saybrook Point and Fenwick, which several residents reported as being particularly dangerous for cyclists. Great Hammock Road, Elm Street under the Amtrak bridge, and Route 1 over the railway bridge between CVS and Pat’s Kountry Kitchen were also identified as areas of concern. Proposed solutions included widening roadways where possible, changing road markings and reducing speed limits. Connolly noted all comments and will incorporate them into her recommendations to the board of selectmen. A second special public meeting will be held on Wednesday, Oct. 20, at the Town Hall. Space is available for five more private moorings off the Pettipaug Yacht Club, but the permittees for these moorings have failed to use them. ESSEX— The harbor management commission has agreed to consider a resident’s proposal to suspend town mooring field privileges for boat owners who do not use the mooring for an entire season. Jerome Wilson presented his proposed “use it or lose it” rule to the panel at a meeting last week. Wilson, a retired lawyer and newsman who has lived in town for 11 years, said a survey he conducted in late July of the Meadows mooring field on the south side of the town harbor found seven of 29 mooring spots completely empty. Wilson, a former boat owner, contends the unused moorings at the Meadows mooring field and at two other mooring fields managed by the commission are unfair to the more than 40 people on a waiting list for a town mooring. He proposed that boat owners who do not use their designated spot for an entire boating season should be disqualified from renewal of the annual mooring permit and placed on the waiting list for future available moorings. Wilson noted the town’s mooring permit regulations specify a mooring is intended for the active use of the permitee. “Not putting a mooring in the water for an entire season certainly does not constitute active use,” he said. Wilson said the panel has agreed to consider his proposed rule, either as a change to the current regulations or in a new written policy. Wilson said he is satisfied with the commission’s response to his proposal. At 1 p.m. on Wednesday Sept. 29, in the Essex Town Hall, First Selectman Phil Miller will introduce area residents who will discuss the creation of a new, non-profit organization, Sister Cities Essex Haiti, whose first project is the establishment of a library/community center in Deschapelles. The Town of Essex has formed a Sister Cities relationship with the Town of Deschapelles, Haiti through the efforts of a group of Essex-area residents committed to strengthening community support of Hospital Albert Schweitzer, located in Deschapelles, and improving the quality of life for people of Deschapelles. Electricity is scarce in Deschapelles. It’s not uncommon to see half a dozen children sit or stand trying to study by the weak illumination offered by a lone street lamp. 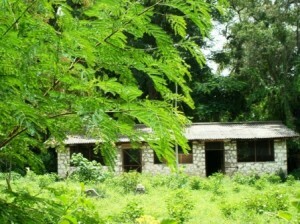 Imagine what it would mean to provide an electrified place of study for children with such a keen desire to learn. This is just one reason why the Selectmen of Essex together with its citizens have joined with the people of Deschapelles to create a library/community center. Through Sister Cities International, the people of Essex and the people of Deschapelles, will work together to continue to support the work of Hospital Albert Schweitzer and Deschapelles. Prospective attendees are requested to contact Dan Taylor-Stypa 860-767-2075 or 978-766-0412 dtaylor-stypa@sjc.edu to confirm attendance. Meet Author and Illustrator of The Last Train at the Essex Steam Train and Riverboat Book Signing on Oct. 2. Essex Steam Train and Riverboat will be hosting a book signing event with the author and illustrator of The Last Train that should appeal to all grandparents, moms, dads and kids! 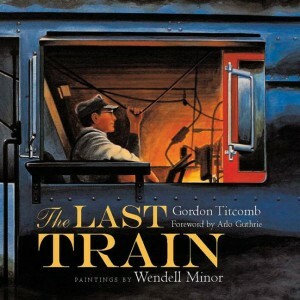 The event will take place on Saturday, Oct. 2, and all are invited to meet the author and acclaimed musician, Gordon Titcomb, and the award-winning illustrator of over 40 books for children, Wendell Minor, who translate their vivid memories of growing up near small town railroad stations into a captivating emotional journey. And what better place to share The Last Train than the perfect storybook setting of Essex Steam Train & Riverboat — located in the village of Essex, with its 1892 freight depot, Essex Station. Illustrator Wendell Minor even chose Essex Steam Train’s Locomotive No. 40 as the “big iron horse” for his paintings throughout the pages of The Last Train! Also on Oct. 2, visiting readers can bring The Last Train to life aboard an Essex Steam Train ride pulled by Steam Engine No. 40. The train will be operated by Engineer Paul Lewis, Road Foreman of Engines and Trainmaster of the Valley Railroad Company . . . not to mention the illustrated “railroad man” driving Engine No. 40 in The Last Train! Book purchase and signing to be held in the Oliver Jensen Gallery in River Valley Junction from 12:00 pm to 3:30 pm. Photo opportunities with Engine No. 40 when train is in Essex Station (15 minutes prior each departure time). Published by Roaring Brook Press, The Last Train was released September 14th by Roaring Brook Press, an imprint of the Macmillan Children’s Publishing Group. Hardcover Picture Book, Nonfiction. Ages 6 and up. $16.99. Valley Railroad Company: Incorporated in 1969, The Valley Railroad Company opened the Essex Steam Train & Riverboat to the public in 1971. Essex Steam Train & Riverboat attracts 150,000 visitors a year and is one of Connecticut’s most vibrant tourist attractions. Tour goers enjoy a 2½ hour narrated steam train and riverboat journey through the scenic Connecticut River Valley. Special events include Day Out With Thomas, Fright Train, Santa Special and North Pole Express. For more information and directions contact Essex Steam Train & Riverboat at 800.377.3987 or visit www.essexsteamtrain.com. Governor M. Jodi Rell announced today that several Middlesex County towns, including Chester and Deep River, are being awarded grants for projects to fix local roads, repair sewer lines and improve area historic sites. Chester – $250,000 to extend a water main to the Haddam town line. “Clean, safe drinking water is imperative, and extending the water main will allow the town to proceed with this essential upgrade,” Governor Rell said. REGION 4— Region 4 school officials have issued a statement on the situation involving Valley Regional High School Principal Eric Rice as the recently hired administrator was reported to remain on the job Monday. The statement echoes comments made Friday by Region 4 Board Chairwoman Linda Hall of Deep River confirming that the nine-member board could have to serve as an “impartial jury” in the event Levy seeks dismissal of Rice, and he asks for a formal public hearing on the action. Hall indicated she has no immediate plans to call a special meeting of the board on the principal matter. Rice was reported to be on the job at the school Monday. There were also reports that some residents may be planning a petition drive in the district towns of Chester, Deep River and Essex on the situation, possibly requesting a public meeting on the situation. On Saturday, Oct. 16 at 7 p.m. there will be an illustrated lecture at the Essex Library, entitled Haunted Happenings, which will explore actual case studies of local hauntings investigated by the Connecticut Paranormal Research Society (CPRS). Join founders and senior investigators of the CPRS, Joe Franke and Orlano Ferrante, and see and hear the evidence for yourself. If you don’t believe in ghosts, this may change your mind. This program is free and open to the public, but is not suggested for children under ten. Please call the Essex Library at 860-767-1560 to register for this program. This will be followed on Saturday Oct. 23 at 6p.m. in the Deep River libraray when Haunted New England Paranormal Research will be discussing the results of three investigations of the Deep River Public Library plus other paranormal investigations they have conducted. Founder Michael Krause has been studying the paranormal for many years. Michael started Eastern Connecticut Paranormal Research in 1992 and recently changed the name to Haunted New England Paranormal Research. They take pride in every investigation and use voice recorders, EMF, K2 meters, temperature meters, and state-of-the art hand held vision cameras and still cameras. Please call the Deep River library for additional information at 860-526-6039. Van Scarecrow, designed by artist Jeffrey Himmelman, is one of the mascots for the month-long festival, Scarecrows at the Museum: A Harvestime Adventure. 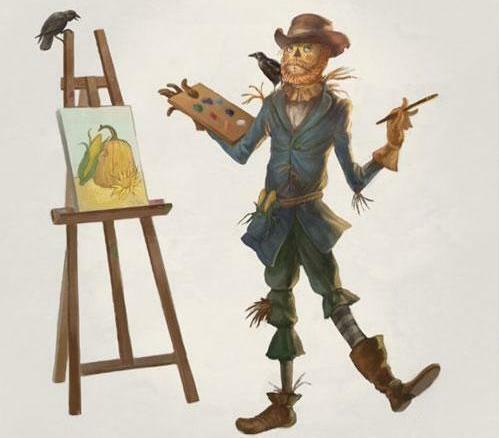 Over 30 artists will transform the Museum's eleven acres into a magical land featuring scarecrows based on famous artists or works of art. Building upon the success of last fall’s Wee Faerie Village, the grounds and gardens of the Florence Griswold Museum in Old Lyme will once again become an enchanted site for fanciful creatures. As with the faerie houses, the creativity and craftsmanship behind Scarecrows at the Museum: A Harvestime Adventure, are sure to delight all ages. From Oct. 1 through 31, over 30 artists will transform the Museum’s 11 acres into a magical land featuring scarecrows based on famous artists or works of art. 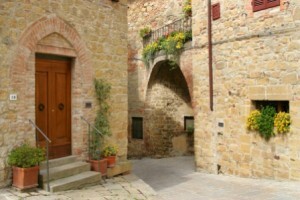 Visitors to the month-long event will find the likes of Van Gogh, Picasso, Dali and others along the self-guided tour. Children will delight in the creatively conceived and handcrafted works of art while adults marvel in the clever connections to the history of art. The Museum has planted a small field of Indian corn for the festival. Visitors can try on a fun assortment of costumes provided and pretend to be a scarecrow. Photo opportunities abound! The Museum is located at 96 Lyme Street in Old Lyme, at exit 70 off I-95 and is open year round Tuesday through Saturday from 10am to 5pm and Sunday noon to 5pm. The Museum will also be open Columbus Day, Monday, October 11 from 10am to 5pm. Admission is $14 for adults, $13 for seniors, $12 for students, $5 for members. Children 12 and under are free thanks to an anonymous grant. Admission includes the Museum’s gardens and grounds, the Florence Griswold House, Chadwick Studio, Rafal Landscape Center and Krieble Gallery featuring the special exhibition With Needle and Brush: Schoolgirl Embroidery from the Connecticut River Valley. Celebrate 10 seasons with Salt Marsh Opera when they present “Oh Say, Can They Sing!”; Tomorrow’s Opera Stars Today at the Katharine Hepburn Cultural Arts Center, 300 Main Street, Old Saybrook on Sunday, Oct. 24 at 5 p.m. The singers and orchestra will be performing arias and ensembles from such favorite operas as Madama Butterfly, Tosca, La boheme, Cosi fan tutte, The Barber of Seville, La traviata, Lucia di Lammermoor, Die Fledermaus, and L’elisir d’ amore. 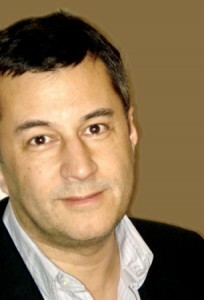 Simon D. Holt is the Executive and Artistic Director. All reserved seats are $52.00. Call the theatre Box Office at 877-503-1286 or www.TheKate.org. Middlesex County Community Foundation will be hosting a Party with a Purpose on Tuesday, Sept. 28, 2010 when they will welcome Dr. Gary Yohe, Wesleyan University’s Woodhouse/Sysco Professor of Economics. Dr. Yohe will discuss the “Six Americas,” unique segments of the American population identified in discussions of climate change. REGION 4— Eric Rice remained on the job as principal at Valley Regional High School Friday as members of the Region 4 Board of Education await the next step in the event he is dismissed from the position by Superintendent of Schools Ruth Levy. Unconfirmed accounts through the week had indicated Rice, a Chester resident who was hired over the summer, had been given an ultimatum by Levy to resign by Friday or face dismissal. Levy, Region 4 superintendent since June 2009, had refused any comment on the situation Thursday. But Eileen Steinfeldt, a friend of Rice’s family who organized a support rally outside the district’s administrative offices Thursday, said she had been told that Rice went to work Friday, a scheduled professional development day with students not scheduled to attend classes. Steinfeldt added that she has been told that Rice has retained an attorney who has been in contact with attorneys for the school district. She did not know the name of the lawyer. Rice, who left a job as principal of a Hartford magnet school to take the position at Valley Regional High School, had been on the job working with students and teachers for about three weeks when reports surfaced of his possible dismissal. Rice is the son-in-law of Region 4 board member Richard Strauss of Chester. Strauss said late Thursday he could not comment on the situation, and was not sure if Rice had retained a lawyer. Strauss had recused himself from votes on Rice’s hiring in July, and would not participate in any possible future proceedings involving Rice. Region 4 board Chairwoman Linda Hall of Deep River said Friday the possibility that Rice could seek a formal public hearing on any move by Levy for his dismissal would prevent her and other board members from obtaining detailed information on any possible reasons for a dismissal action. Hall said if Levy acts to dismiss Rice “the board must be prepared to act as an impartial jury” for any possible dismissal hearing. “I have to make sure the board is not tainted and can provide fairness and due process for all parties concerned,” she said. Hall said around mid-day Friday she has no immediate plans to call a special board meeting on the principal controversy. “As of right now no action has been taken,” she said. The Region 4 board’s next regular meeting is on Oct. 7. Hall added that if or when the superintendent moves to dismiss Rice, the district would issue a news release announcing appointment of an interim principal for the high school. Rice is the third principal for the high school since September 2006, succeeding Ian Nevaiser, an Essex resident who held the job for two years before he was named as the district’s assistant superintendent in June. Donald Gates, the retired long-time principal at Portland High School, had served as interim principal at VRHS for the 2006-2007 and 2007-2008 academic years. Fall Ball committee members and honorees finalize plans for the October 23 celebration at the Connecticut River Museum. L-R: Marc Iacobellis of the Shiny Lapel Trio, Sponsor Greg Shook of Essex Savings Bank, CRM Trustee Jennifer Caulfield, Essex Deputy Fire Chief Andrew Kressley, Honorary Chairman Doug Paul of the Paul Foundation, CRM Executive Director Jerry Roberts, and Sponsor Maureen O’Grady of Rachel Thomas Associates. 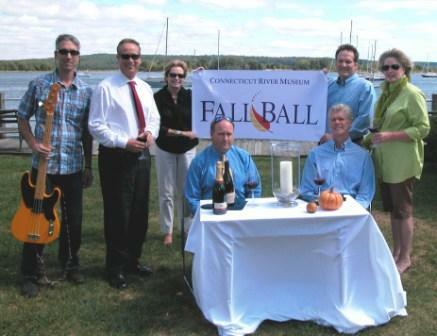 Essex, CT – With the repair and restoration of the fire-damaged Connecticut River Museum now underway, committee members are finalizing plans for Fall Ball, the Museum’s most important fundraising event of the year that takes place on Saturday, October 23. This special evening of cocktails, dinner, dance, and auction will celebrate community spirit and all those who help make the River Valley a vibrant, welcoming place to raise and educate children, enjoy friends, conduct business, and experience the beauty of the Connecticut River. Members of the Paul family, who have made significant contributions to help preserve the community’s cultural heritage, have been named as honorary chairmen. Volunteer fire department chiefs from Essex, Deep River, Old Saybrook, and Westbrook, who exemplify the ultimate community commitment and dedication, will be honored guests. Festivities will begin at 5:30 pm with cocktails and dinner on the waterfront grounds of the Museum. The swinging sound of the Shiny Lapel Trio will keep guests moving while a silent and live auction promises tremendous opportunity to purchase luxury items and unique experiences at exceptional value. Presenting sponsors include Essex Savings Bank, Essex Financial Services, and Rachel Thomas Associates. Net proceeds will help fulfill the Museum’s mission to increase public awareness, education, and access to the rich heritage and natural beauty of the Connecticut River. All are invited to attend and lend their support by either purchasing individual tickets for $175, patron tickets for $250, or a sponsorship. Those who can not attend but want to recognize fellow community members can make a financial donation starting at $100 to the Community Pages of the Fall Ball program book. To find out more and to purchase tickets, go to www.ctrivermuseum.org or call (860)767-8269. The Connecticut River Museum, located at 67 Main Street in Essex, is a private, non-profit organization dedicated to lead in the study, preservation and celebration of the cultural and natural heritage of the Connecticut River and its valley. Essex, CT – This Columbus Day weekend Essex will be jamming with plenty of family fun going on throughout the riverport town. Creatively-themed scarecrows made by individuals and businesses will fill lamp posts, lawns, and benches along the village streets of Essex, Centerbrook, and Ivoryton while the Second Annual Scarecrow FestiFall celebration kicks off on Saturday, October 9 at 3 p.m. on the grounds of the Pratt House located on West Avenue near Essex Town Hall. 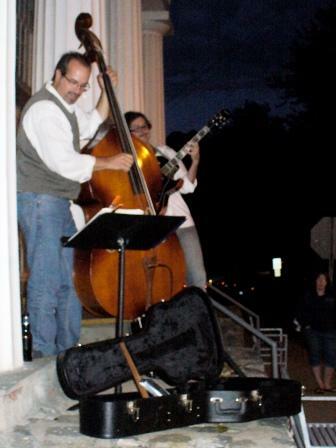 The band Long Island Sound will get the FestiFall moving from 3 pm to 6 pm with popular tunes from the 1940’s thru today. 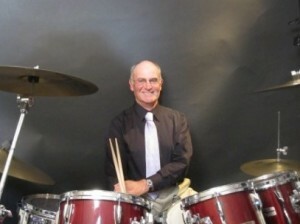 The ensemble features Ivoryton drummer and vocalist Gary Ribchinsky as well as the talented duo of Brad and Brian. The musical performance is being sponsored by Bob’s Discount Furniture. Games, food concessions by the Essex Lions Club, raffle prizes, a pie baking contest, and the opportunity to vote for your favorite scarecrow will also take place until 6 pm. Then, at dusk, a special big screen presentation of The Wizard of Oz will be shown. Popcorn and candy will be available for purchase but bring lawn chairs and blankets. Admission is free. A portion of food and raffle ticket sale proceeds will benefit Breast Cancer Research. The rain date is Saturday, October 16. For more information, go to www.essexct.com. REGION 4— About 50 parents, students, and residents gathered outside the school district’s administrative offices in Deep River Thursday to protest a move by Superintendent of Schools Ruth Levy to dismiss the newly hired principal at Valley Regional High School. The rally was organized on short notice by Chester resident Eileen Steinfeldt after she learned earlier this week that Levy had reportedly given Principal Eric Rice until Friday to resign or face dismissal. Rice, a Chester resident, was hired as principal over the summer. Steinfeldt said she does not have children attending the high school, but knows Rice, a father of three, and his family. Students at the rally said they had a positive impression of Rice from the last three weeks, and also commented on what they have heard were the reasons for Levy’s action. Zack Sanders, a senior from Chester, said he was told Levy objected to Rice “high-fiving” a special education student and believed that he had behaved inappropriately at a recent open house for parents. Sanders said he was present at the open house and witnessed nothing inappropriate about’s Rice’s behavior that evening. There have also been reports Levy objected to Rice bringing a Blackberry computer with a recording device to a meeting of administrators. “If those are the reasons they don’t warrant having his job taken away,” Sanders said. Sanders said Rice had been a welcoming presence at the school over the past three weeks, greeting students on arrival and reaching out to talk to them individually. “We thought he was doing a great job,” he said. Steven Klinck, another senior from Chester, said students and teachers are wondering what Rice had done to warrant an abrupt dismissal. “We don’t get it” he said. Students said Rice was absent Tuesday, but was seen at the school Thursday. There are reports Rice was advised of Levy’s concerns at a meeting on Sept. 16, and was given the reported leave or face dismissal ultimatum the next day. 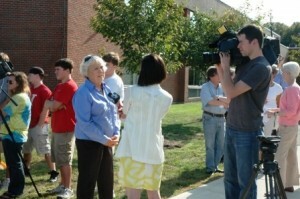 The rally lasted about 40 minutes as students and parents talked to various media reporters about the situation. The gathering was monitored by Deep River police constable Raymond Sypher. Region 4 board members, including Chairwoman Linda Hall of Deep River and vice-chair Mary Beth Harrigan of Essex, could not be reached Thursday for comment. The nine-member elected board held its last regular meeting on Sept. 2, with Rice and other administrators present at the meeting. Duane Gates, a board member from Deep River who drove past the gathering, declined comment. But Gates said he does not know the details of the situation involving Rice, and is not certain when the board would meet to discuss the situation and the future of the principal position at the high school. Rice, who worked previously as principal of a science and technology magnet school in the Hartford school system, is the son-in-law of Richard and Leslie Strauss of Chester. 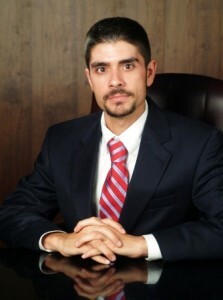 Richard Strauss is a member and current treasurer of the Region 4 board. He could not be reached for comment Thursday. 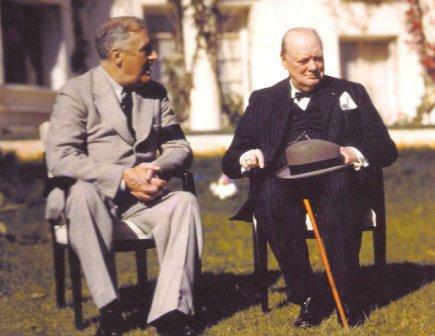 A second in the series of illustrated lectures on the life and times of Winston Churchill, ‘Churchill / Roosevelt and the Outbreak of the Pacific War’, will be presented on Thursday, October 21st at 7 P.M. at Essex Meadows auditorium. The speaker, Dr. John H. Maurer, is the Chair of the Strategy and Policy Department of the United States Naval War College at Newport, R.I., and has written and spoken extensively on Churchill’s career. The talk, presented in association with the Essex Library, will be free and open to all. A wine and cheese reception begins at 6:30, and coffee and cookies will be served afterwards, thanks to the generosity of Essex Meadows. For more information on the program, or to register, please call the Essex Library at 860-767-1560. 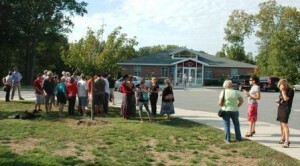 Directions to Essex Meadows can be found at their website, www.essexmeadows.com, or by inquiring at the Library. Essex Meadows is located at 30 Bokum Road in Essex. My constant harangue against traffic and in favor of trains aside, I do own a car: a used ’97 Honda Accord with 130,000 miles on it. It’s a great car (the interior infused with cigar smoke notwithstanding), and I hope to run it into the ground. Used cars are hot these days. Prices have climbed 10% in a year as more drivers decide to hold onto their cars longer. And why not? We don’t have to be suckers to Detroit’s game of staking our egos on each year’s new model, which immediately loses 20% of its value the day we drive it home. Used cars can prove perfectly reliable, if you keep them in good shape. So when I saw a TV infomercial for CarMD, a device that promised a simple way to keep my jalopy going, I was jazzed. I love car tech and this sounded great! Rather than popping the $99 for the gizmo myself, I suggested to the Darien Library that they purchase one. Yes, I am truly blessed to live in a town with a tech-savvy library that offers patrons any number of gizmos on loan… GPS devices, digital cameras and Kill-A-Watt readers. But now I’m feeling a bit guilty. Here’s how Car MD is supposed to work. You take the remote unit, about the size of a fat TV remote, and plug it into your car’s computer output. There’s the first challenge: finding that plug. But the www.carmd.com website has a simple guide by make and model. My plug was behind the ashtray of my ’97 Honda Accord. In my wife’s ’96 Volvo, it was under the coin holder. Once you’ve turned on and plugged in the CarMD gizmo, you turn on the ignition but you do NOT start the car. The handheld device talks to your car’s computer, downloads the information, beeps four times and you’re done. Well, sort of. If the handheld device shows a green light (as on my trusty Honda), you’re OK. Your car’s computer has found no problems. But if it’s a yellow light, as I saw on the Volvo, the fun begins. Next you have to copy down your car’s VIN (vehicle identification number). Good luck reading that, if you can find it. But here’s where I was disappointed. When I clicked the “check health status” button, the software displayed umpteen TSB’s (Technical Service Bulletins) for the Volvo going back to 1992 (even though the car is a ’96) but to read the full details it’s $1.99 per report or $19.95 a year to read them all. Worse yet, the software told me nothing about why the yellow light was showing on the handheld device. A call to CarMD’s Customer Service (friendly and knowledgeable) got to the root of the problem: the Volvo’s “check engine” light wasn’t on. In other words, unless your car’s computer has already found a problem and turned on that ominous dashboard display, CarMD isn’t going to tell you much of anything. But it will ask you for money. CarMD is nothing but a big thumb drive, no smarter than your car’s computer. Now, had my check engine light been on, Car MD would, in theory, have told me what’s wrong with the car and given me an estimate of how much it would cost to fix it: valuable info to arm myself with before heading to the service station. But until the “check engine” light shows up on your dashboard, save your money. CarMD isn’t going to do more than frustrate you. Save your dough… maybe to buy a new used car. JIM CAMERON has been a commuter out of Darien for 19 years. He is Chairman of the CT Metro-North / Shore Line East Rail Commuter Council, and a member of the Coastal Corridor TIA and the Darien RTM. Read his column on LymeLine every other Monday. You can reach him at Cameron06820@gmail.com or www.trainweb.org/ct . CHESTER— A special permit application for an organic foods market in a vacant building at 56 Middlesex Avenue has been withdrawn after the -planning and zoning commission determined that inclusion of plans for a 24-seat cafe area would represent an illegal expansion of a non-conforming use. The market would be located in a 4,800 square-foot building at 56 Middlesex Avenue (also known as Route 154) that has been vacant for about two years. The building, located in a residential zone, had previously housed a garage, and most recently marine and bycycle repair shops. Commission Chairman Michael Joplin advised Kehayias soon after the start of the puiblic hearing that inclusion of plans for a cafe-style seating area where patrons could consume sandwiches and other items purchased at the market could represent an expansion of the non-conforming use that was established for the property by the former L&I Garage that opened in the 1930s, before the adoption of local zoning regulartions. Joplin noted the previous commercial uses of the structure had sold services and some commodities, but did not include sale of food items for on-site consumption. Joplin urged Kehayias to submit a new application for a basic retail market for sale of produce and other food items, with no on-site seating for patrons. Kehayias withdrew the application before the hearing was opened for comments from the public. The lights were bright, but people’s spirits were brighter during the opening festivities of the 20th Annual Come Home to Chester Days. Stores and galleries remained open late to welcome shoppers and visitors alike. Pedestrians crowded the sidewalks (and sometimes the street) outside of lighted windows. Stores like The Local Beet offered free samples while other venues, like The Hammered Edge, held special sales. 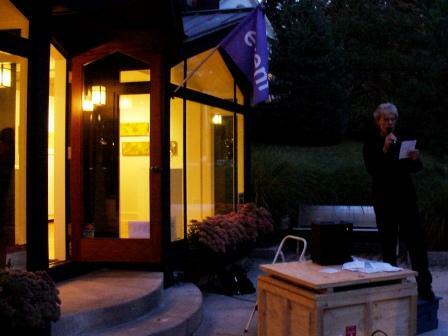 A spoken word artist performed outside e o art lab, drawing an audience of appreciative listeners. Light and music spilled out of various venues, while a live band performed on the steps of C+G Unparalleled Apparel (first floor) and C+G Posters and Prints (second floor). 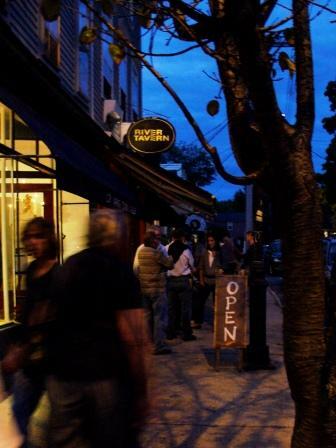 While the streets were less busy by the end of the night, shoppers and visitors still crowded the venues sidewalks. As the Sign Says - Everything Was Open! Todd Ellison, Broadway Musical Director,Lyme resident, and Essex native son, will be joined by friends from New York City to provide an exciting evening of entertainment on Monday, Oct. 4 at 7 p.m. at the Valley Regional High School Theater in Deep River, CT. After spending several years as the Musical Director and Vocal Arranger for Spamalot, Todd is currently Musical Director/Conductor for the ward winning musical La Cage Aux Folles. Scheduled to appear with him are Jonathan Freeman who was the voice of Jafar in the Disney movie Aladdin and is now in Mary Poppins, Chester native Peter Lockyer who is currently in South Pacific and played Marius in Les Miserables, Mary Testa who was in On the Town and 42nd Street, and Dominique Plaisant of Broadway’s The Wild Party and Lestat. Also joining will be Deep River native, Ryan Driscoll –The Summer of ’42. Putnam), and Literacy Volunteers Valley Shore. General admission tickets are $30 presale and $35 at the door. Tickets can be obtained at H.L Reynolds (Jane’s) Store in Lyme, the Bowerbird in Old Lyme, Grillo’s Package Store in Centerbrook, Literacy Volunteers Valley Shore, 25 Middlesex Tpke in Essex, and Valley Regional High School in Deep River. For information call 860 767-1202. The show is sure to sell out so get your tickets now. September is National Senior Center Month and the Estuary Council of Seniors, Inc. (ECSI) is celebrating. They have recently opened their doors to all residents in the nine-town estuary region who are aged 50 and older. “Baby Boomers”, who probably don’t feel like seniors, can take advantage of the activities, trips, and diverse programs in the community, mostly free of charge. They can shoot pool, have a cooked-to-order breakfast six days a week, join an exercise group, the painting class, play ping pong, Wii bowling, join the book chats and many other activities. Most of the programs are free of charge or just a suggested donation. 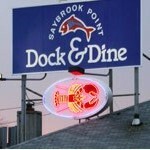 September is also the time when the Estuary Council of Seniors hold their signature event, “Autumn on the Dock,” at the Dock & Dine restaurant in Old Saybrook – it will take place on Sept. 26 from 5 to 8 p.m. The evening will include live and silent auctions, wine tasting and hors d’oeuvres, and will benefit the Meals on Wheels and Senior Nutrition Programs. The Estuary Council of Seniors is the sole provider of meals on wheels to homebound seniors in the nine-town estuary region and Madison. Last year they delivered more than 64,000 meals. ECSI is generously supported by the following sponsors: Lenny & Joe’s Fish Tale, Middlesex Hospital, J.H.Cohn, LLC, Essex Savings Bank, Gentiva Homecare, Lawrence & Memorial Hospital, The Wine Cask, Guilford Savings Bank, SafetyZone, Underwater Construction, Shoreline Quick Lube, Essex Meadows, Roberts Physical Therapy, Middlesex Hospital Homecare, Reid & Reige, P.C. Tickets for the event are $40. On Saturday, Sept. 25, the Florence Griswold Museum will be filled with high spirited partygoers during its 28th Annual Benefit Auction and Dinner Dance. This year’s theme, An Evening in the Country hints of the casual elegance that surrounded the parties given by the artists of the Lyme Art Colony. All proceeds directly support the Museum’s education and outreach programs on Connecticut’s art, history, and landscape. The evening features cocktails, live and silent auctions, a seated dinner prepared by Jonathan Rapp and River Tavern of Chester, and music by the Shiny Lapel Trio. The Auction will begin at 6pm and will feature 140 outstanding treasures including extraordinary paintings and drawings from regionally and nationally known artists, a variety of jewelry and decorative objects, and very special trips and services. Reservations are required and can be made online at www.FlorenceGriswoldMuseum.org. For more information, contact Sarah at 860-434-5542, ext. 122. Tickets will start at $150. The Florence Griswold Museum gratefully appreciates Webster Bank and Connecticut Light & Power for their support of the Auction Benefit. Located on an 11-acre site in the historic village of Old Lyme, the Florence Griswold Museum is known as the Home of American Impressionism. In addition to the restored Florence Griswold House, where the artists of the Lyme Art Colony lived, the Museum features a modern exhibition gallery, education center, a new landscape center, extensive gardens, and a restored artist’s studio. The Museum is located at 96 Lyme Street, Old Lyme, CT, exit 70 off I-95 and is open year round Tuesday through Saturday from 10am to 5pm and Sunday 1 to 5pm. Starting Oct. 2, 2010 through Jan. 30, 2011 the Florence Griswold Museum in Old Lyme, Connecticut, will be presenting With Needle and Brush: Schoolgirl Embroidery From the Connecticut River Valley. The Connecticut River Valley was one of the most important centers in America for the teaching and production of embroidered pictures by girls and young women in private academies during the late eighteenth and early nineteenth centuries. As the first exhibition to examine the subject of Connecticut River Valley needlework in depth, With Needle and Brush contributes to the understanding of the traditions of needlework and provides insight into the nature of women’s schooling before the advent of widespread public education. Guest-curated by needlework experts Carol and Stephen Huber, this exhibition of approximately sixty embroideries, watercolor sketches, and portraits will draw extensively on works from private collections, many never before shown publicly. Over the course of their education, girls undertook progressively more complex and difficult needlework. Before the age of ten, they began with elementary samplers worked on linen and gradually developed a repertory of stitching techniques. 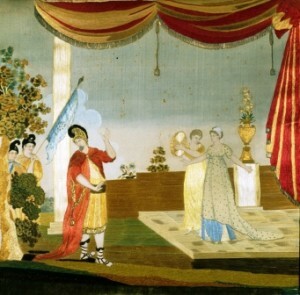 During their studies, they executed canvaswork pieces, samplers, memorials, and silk pictures as evidence of the skills and accomplishments that would demonstrate their suitability as wives capable of managing a household and educating children. Proudly displayed in a family’s home as an enticement to potential suitors, these pictures and memorials affirmed a young lady’s mastery of the principles of “politeness”—a concept that encompassed knowledge of religious and literary themes as well as an appreciation for art and music. The exhibition illuminates the evolution of needleworking techniques as well as tracing the distinctive styles and subjects associated with the mistresses of various girls’ schools throughout the Connecticut River Valley. At the academy run by Lydia Royse in Hartford, pupils specialized in allegorical or historical subjects based on print sources, which they replicated in gleaming silk thread. One such piece is Jeptha’s Rash Vow (ca. 1810), which presents the Biblical tale of a father obligated to sacrifice his only daughter to fulfill his pledge to God that, in exchange for a military victory, he would kill the first thing he sees upon returning home. “Needleworks like this one are truly extraordinary in their aesthetic and intellectual sophistication, and as windows into early American values” says Florence Griswold Museum Curator Amy Kurtz Lansing. “The unknown girl who stitched this picture is affirming the religious tenet of subservience to God, and doing so through a subject that was also explored around this time in poems, prints, and even an oratorio by Handel. Through their needlework, girls from even small towns were introduced to and participated in wider cultural currents.” For instance, girls at the Misses Pattens’ School, also in Hartford, worked lavish heraldic and allegorical compositions, often accented with gold filaments. Each piece of needlework unifies the combined talents and aspirations of the girl, her family, her instructress, and the visual artists often called upon to paint in portrait heads that would complete each piece. The exhibition will be followed by a fully-illustrated book with essays and entries by the Hubers, an essay by independent scholar Susan Schoelwer, and an introduction by Amy Kurtz Lansing. The book will be published in 2011 in conjunction with Wesleyan University Press. Located on an 11-acre site in the historic village of Old Lyme, the Florence Griswold Museum is known as the Home of American Impressionism. In addition to the restored Florence Griswold House, where the artists of the Lyme Art Colony lived, the Museum features a modern exhibition gallery, education center, a new landscape center, extensive gardens, and a restored artist’s studio. The Museum is located at 96 Lyme Street, Old Lyme, CT, exit 70 off I-95 and is open year round Tuesday through Saturday from 10am to 5pm and Sunday 1 to 5pm. Admission is $9 for adults, $8 for seniors, $7 students, and free to children 12 and under. For more information, visit the Museum’s web site www.FlorenceGriswoldMuseum.org or call 860-434-5542 x 111. The Planning & Zoning Commission of Deep River is holding a public information session on Wednesday, September 22nd at 7:30 pm at Town Hall to introduce the concept of Village Districts in Deep River. Village Districts, authorized by Connecticut General Statute 8-2j, gives municipalities a tool to protect the character of their villages or other identified distinctive areas. Such districts are to be located in areas of “distinctive character, landscape or historic value”. Deep River’s Town Plan of Conservation and Development calls for the establishment of Village Districts or zones, specifying the areas of town to be considered. Furthermore, the Town Plan sets goals of maintaining the small town character of Deep River and enhancing the pedestrian nature of Deep River Center, encouraging development compatible in scale and style, incorporating features in keeping with the historic character of the town. The Regulations & Planning Committee of the Planning & Zoning Commission formed a sub-committee of its members, other interested Deep River property owners, and the Connecticut River Estuary Regional Planning Agency late in 2007. Over two and a half years of work, the Village District Sub-Committee studied the enabling statutes and the goals of the Town Plan of Conservation and Development and considered the ways in which Village District zoning regulations could preserve the character of Deep River. The Sub-Committee met with small groups of property owners for input and has now drafted a framework of regulations. On September 22nd, the Village District Sub-Committee will explain how Village District zoning, unlike other zoning, allows a Zoning Commission to consider “the design, relationship and compatibility of structures, plantings, signs … and other objects in public view”. It will present the regulations which it has drafted and seek public comments. After the information session, the Village District Sub-Committee will return to the drafting table and incorporate what it has heard from the public. It is anticipated a Public Hearing will be held early in 2011 to hear testimony regarding proposed regulations, before action by the Planning & Zoning Commission. ESSEX: A debate is brewing over a proposal to change the rules regarding vacant moorings in Essex Harbor. A local Essex resident, Jerome Wilson, will call upon the Essex Harbor Management Commission, at its meeting on Thursday, Sept. 23 at 7:30 p.m. at Essex Town Hall, to adopt a rule to end the practice of permitting boaters in Essex Harbor to renew their mooring spots in cases where they, year after year, fail to use them. Wilson claims there are 49 persons on the official ‘wait list’ for a mooring in the town’s three mooring fields, and that a substantial number of persons holding town moorings simply leave them vacant in the water. Wilson is urging the Harbor Commission, which, with the Essex Harbor Master regulates moorings in Essex Harbor, to adopt what he terms a “use it or lose it” rule. Such a rule would provide that if a town mooring holder does not put in the water ground tackle, including anchor, chain and a marker buoy, to moor his or her vessel during the boating season, the holder of the mooring would be disqualified from renewal of his or her mooring permit. 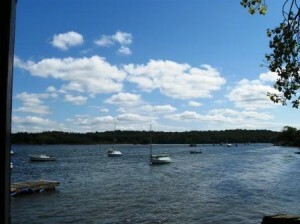 After conducting an informal survey in the waters of the Meadows mooring field in Essex in the Connecticut River last July in the peak for the boating season, Wilson found that of the 29 assigned moorings in the Meadows field, seven of them were empty. Following his survey, which took place in a launch provided by the Pettipaug Yacht Club, Wilson personally called the seven absentee mooring holders, and he convinced a couple of them to put moorings in the water. Wilson would like the town harbor authorities to adopt an amendment to the harbor regulations requiring the holder of a town mooring permit to put mooring tackle in the water for his or her boat during the boating season, otherwise the boater’s mooring permit will not to be renewed. This proposed rule would further call for a boater denied renewal of his mooring to go to the end of the “wait list,” if another mooring permit were requested in the future from the town. 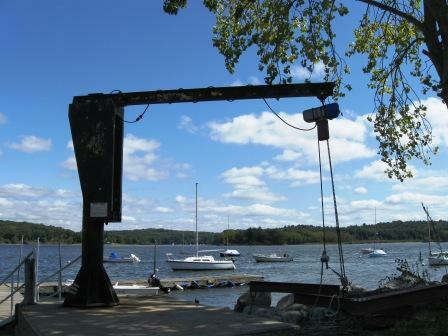 The Pettipaug Yacht Club boat hoist stands ready to help put moorings in the water for five empty mooring spaces. The Friends of the Essex Library will be holding a Book Sale at the library at 33 West Avenue in Essex to raise funds for numerous special library programs and activities. 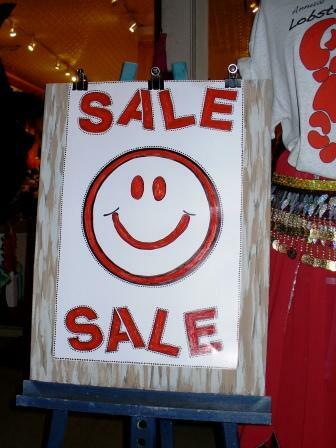 The sale will take place at the library on Saturday, Oct. 2 from 10 a.m. to 5 p.m. andon Sunday, Oct. 3 from 1 to 5 p.m. The sale will consist of well-sorted used books in good condition on cooking, gardening, history, literature, art, travel, philosophy, science, nature, nautical subjects, sports, self-help, foreign languages, etc. There will be tables of fiction, children’s books, paperbacks, sets of books, audio-visual materials, and there will a table devoted to the approaching holidays. All items will be half price on Sunday. On book-sale Saturday library materials can be checked in and out from 10 a.m. to 2 p.m., but computers in the adult section will not be available for use. There will be no library services on Sunday, when all book-sale items will be half price. There is more specific information about this particular sale, including the names of many titles offered in the various categories, at the Friends section of the Essex Library website www.essexlib.org. Mary Carnevalini is part of the 96 percent of Connecticut propane gas customers who are at the mercy of their propane suppliers because they don’t own their own tanks but instead rent them from the dealers. While propane gas can be a great alternative to heating oil and electricity if natural gas lines are unavailable, Carnevalini and the estimated 200,000 other propane customers in Connecticut have learned or are learning that it’s easier to figure out how a nuclear plant works than whether or how much they are being ripped off. Propane is used as fuel for stoves, water heaters, furnaces and other equipment. Carnevalini uses propane to heat a swimming pool. Heating oil companies will quote you a price 24/7. Any firm that sells in your area will deliver to you. Comparison shopping is easy. Everyone owns their own tanks and anyone can fill them. Propane gas is the least transparent energy business in the country. Companies normally don’t list their prices, they frequently won’t give you a quote over the phone, and they all have different prices with different add-on charges, making comparisons impossible. The biggest weapon propane gas companies have is a set of rules adopted in Connecticut and every state in the union that require the home or business owner to purchase the gas from the company that owns the tank at their home or business. The suppliers convinced the states to adopt the rule by claiming that the liability for filling a tank not owned by the dealer would be too great. So then why aren’t the four percent who own their tanks seeing those tanks explode every day? And propane gas companies do their best to discourage people from buying their own tanks by falsely claiming that their insurance will increase and that it’s less dangerous to rent than to buy your tank. Many also refuse to sell the tanks that customers have been renting from them, or charge what a new tank would cost. Carnevalini, of Winsted, contacted me earlier in the month asking me what she should do about her propane supplier, Arrow Gas, which has offices in Connecticut, Massachusetts and Rhode Island. The company – which in Connecticut operates from Waterbury and Windsor Locks, tacked on an extra annual charge of $100 for her swimming pool propane tank because she did not use the minimum amount that the company requires. She said she complained to Arrow but the company would not bend. Arrow officials have not returned my phone call requesting comments, and I am not sure the company could have made its fee stick. First of all Carnevalini never had a written contract with the company and she said she did not receive the fee disclosure pamphlet until this month. While the letter she received stating the firm will waive the fee states as long as she uses one tank of propane gas every year. The pamphlet it sent her does not specify how much gas is the minimum required. 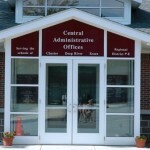 You can see the documents at www.ctwatchdog.com. “It gets more confusing,” she said. If she waits to call the company after using the full tank she gets an extra charge because Arrow has to do extra work when a tank is empty. Normally firms require that 20 percent be kept in tanks as a minimum. Second, the minimum order is 50 gallons for her 100 gallon tank, and even if she only needs 40, she says Arrow charges her for 50. Despite all this, Connecticut consumer officials told her that Arrow’s prices were cheaper than other companies charge small users. Arrow only charged her $2.54 a gallon while some other propane gas companies are charging as much as $7 a gallon for small users. Farrell has instituted rules requiring that propane companies be more up-front about their charges and provide customers with bill-of-rights statements. However, for those who rent their tanks, the propane companies still hold guns to customers’ heads. My suggestion: Before buying any equipment that requires propane, check the real costs. If possible, buy your own tank and then shop around. Essex, CT – Once again leaf peepers and nature lovers alike can enjoy a glorious, new perspective on New England’s change of season from the peaceful waters of the Connecticut River. The Connecticut River Museum, located on the scenic Essex waterfront, has announced the schedule for river cruises aboard the historic schooner Mary E now through October. Afternoon excursions, which run for 1.5 hours and include admission to the museum’s exhibits and galleries, are $26 per adult and $16 for children age 12 and under. Two hour sunset sails are $30 per person, all ages. Group tours and private charters are also available. 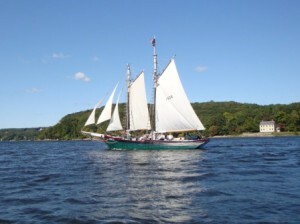 For information on daily departure times and group charters, call 860-767-8269 or go to www.ctrivermuseum.org. The Connecticut River Museum, located at 67 Main Street, Essex, CT, is a private, non-profit organization dedicated to preserving the cultural heritage and natural beauty of New England’s Great River. 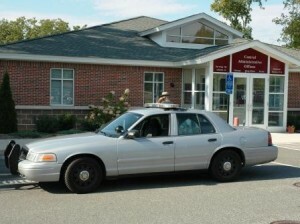 ESSEX— The board of selectmen has approved accepting a second resident state trooper on a temporary basis to help cover patrol shifts while one officer is out on medical leave. Resident State Trooper Kerry Taylor appeared before the board Wednesday to explain the request. Kerry said one officer is on medical leave, possibly through the end of the year, leaving officers Russ Gingras and Mark Pischotti stretched to cover patrol shifts. Officer Salvatore Bevilacqua suffered a knee injury on the job earlier this month and is now on medical leave. The town’s fourth full-time officer, April Pawlow, has been on leave since May, attending classes at the Connecticut Police Academy in Meriden to become a state trooper. Taylor said Pawlow has about eight weeks of training to complete, and will likely be hired in November as a Connecticut state trooper. Tayor said securing a temporary additional resident state trooper is the best way to maintain police coverage over the next few months. DEEP RIVER— A Sept. 28 town meeting is expected to vote on a resolution establishing a new community health committee that would oversee a charitable fund that had been managed by the now disbanded Deep River Public Health Nursing Agency. The board of selectmen, in approving the resolution at a meeting Tuesday, also appointed the intial three members of what will become a five member committee. The members appointed so far include former Selectman Russell Marth, Dr. Kristin Zarfos, a surgical oncologist at St. Francis Hospital, and Carl Olson, a retired nurse. The three initial members will also serve as the town’s representatives to the Visiting Nurses of the Lower Valley board of directors, the Centerbrook-based regional nursing agency that assumed various public health functions in Deep River after the Deep River Visiting Nurses was disbanded on July 1. Voters at a May 18 referendum had discontinued funding the Deep River Puiblic Health Nurses, which had coordinated viisiting nurse services in town for decades. Along with serving as liaison to the regional nursing agency, the community health committee would also manage the Memorial Fund, a charitable fund that had been run by the Deep River Public Health Nursing Agency. The fund, which contains about $70,000 donated by residents over the years, had been used to provide special assistance, including food, fuel, and medicines, to needy Deep River residents. The community health committee would be charged with managing the Memorial Fund as “a special segregated town fund for charitable purposes”, and developing eligibility criteria for disbursements from the fund. Members of the community health committee would be appointed to the board of selectmen, subject to confirmation from a town meeting, for two-year terms. First Selectman Richard Smith said two additional members of the community health committee would be appointed after the Sept. 28 town meeting formally adopts the ordinance establishing the committee. Visiting Nurses of the Lower Valley Inc. has been coordinating visiting nurse services in Deep River since July 1. Registration begins at 9 a.m. and participants can choose between a 50K bike tour, a 10K bike tour or a 5K walk. The 50K bike tour will begin at the Memorial Park in Old Saybrook and will pass through the towns of Essex, Deep River and Chester along the Connecticut River, returning to Saybrook Point with spectacular views of Long Island Sound at the finish. Riders can also opt for a 10K ‘loop’ around Saybrook Point taking in the same wonderful views. The third option is a 5K walk that will begin at Fort Saybrook and cross South Cove to the picturesque Borough of Fenwick before returning to the park. This family oriented event will provide important cancer awareness information from health professionals as well as highlighting southeastern Connecticut’s first cancer survivors’ fitness program called Hope Is Power. Register online at www.active.com (keyword: Saybrook PT) or for more information, visit www.vsymca.org, or call (860) 399-9622. Hope Is Power is a new program run by Valley-Shore YMCA that is designed to help cancer survivors regain their physical fitness and sense of well being. A twelve week session is currently underway and a new session will begin in September. The program includes cardiovascular, strength and relaxation techniques to combat the effects of cancer treatment. The program is open to all adult cancer survivors, and is free of charge. Proceeds from this event will benefit The Lance Armstrong Foundation and Valley-Shore YMCA, both 501 (C) (3) charitable organizations. Gone are the days of sitting outside waiting for the bus to arrive. With the recent addition of text messaging by 9 Town Transit, passengers will receive a text message on their cellular phone telling them when the bus will arrive. Passengers can sign up for the service when making a reservation. 9 Town Transit’s scheduling software will automatically send a text message shortly before the scheduled pick up time with the actual expected arrival time, reducing wait time for passengers. The arrival times are based on real-time GPS data at the time of the text message to provide an accurate estimate. While there is no charge by 9 Town Transit for this service, cellular service providers standard text message rates do apply. Historian and author John Laurence Busch of New Canaan, CT will present Steam Coffin, a special program at the Connecticut River Museum on Thursday, October 7. 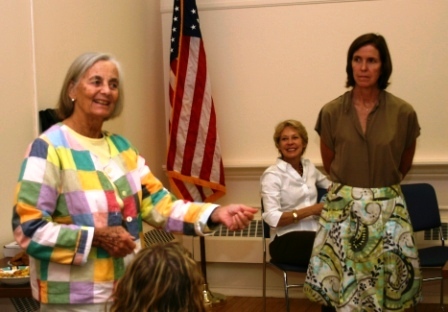 Essex, CT – Now in reconstruction after a severe fire in August, the Connecticut River Museum has re-opened the Boathouse Gallery and Education Center and announced the return of its monthly lecture series. On Thursday, Oct. 7 from 5:30 pm to 7:00 pm, the fascinating age of steam power comes back to life with a provocative program presented by historian and author John Laurence Busch. Steam Coffin: Captain Moses Rogers and The Steamship Savannah Break The Barrier will transport you to the experimental days of steam-powered boats and show why the proposition of making the first crossing of the Atlantic Ocean on a “steamship” was met with a mixture of skepticism and fear. 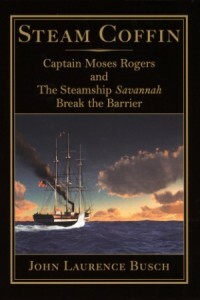 Based on extensive research done by Mr. Busch for his new novel of the same name, the program will highlight the significant role played by New London Captain Moses Rogers, one of the first steamboat captains in history. A book signing and light refreshments will follow the program. Admission is $5 for the general public but free for Connecticut River Museum members. Please call (860)767-8269 to reserve a spot or go to www.ctrivermuseum.org for more information. The Connecticut River Museum is located at 67 Main Street on the Essex waterfront. Odd, the first time I noticed it. It was a September evening just before I entered Peace Corps. I stopped by the Phoebe Griffin Noyes Library in Old Lyme. One of my favorites. Just one car in the parking lot. But the library was closed. I recognized the old car. Jack was behind the wheel—I’ll call him Jack. I walked over to say Hi. He was hunched down. About 40. Walked to his own drummer. Worked at this and that, as he needed to. Fiercely independent. Sharp. He was so intent that he didn’t notice me coming. It was all completely new to me. I had had no idea. Wi-fi—Internet without wires. Without walls, so to speak. I saw it again in Morro Bay, California. Was visiting my daughter Monique and her hubby David. I enjoy the little but very fine Morro Bay Library. It was late afternoon. Balmy day. A VW Microbus was parked among the others, but close to the building. I had a Microbus once. For about three years after I retired. Cruised the U.S. in it, even down into Mexico and up into northwest Canada. Sight-seeing, having fun, learning so much along the way. One man in this Microbus. He had slid the broad side door open. Was sitting at the tiny table, working a computer. The radio was playing some Mozart. Was having a grand time. I didn’t need any explanation now. I knew what he was doing. The library was open, but he was accessing its wi-fi. He preferred to be outside. His van had a Nebraska plate. I’ll bet he was looking up a library wherever he went on his travels. I never saw anything like this in Ukraine during my 27 months of Peace Corps service. The technology just wasn’t up to snuff. They had the Internet, but limited. I used public Internet shops, paying by the minute. How happy I was when I discovered the huge downtown public library. It had only two Internet-connected computers, both thanks to uncle Sam. How delighted when I discovered them. Free! I kept it secret from my Peace Corps colleagues—didn’t want them in line competing with me for one. Finally my conscience bothered me and I told them. They reacted just as I expected, to my regret. Well, I saw the same wi-fi behavior just last Sunday. Early morning. I went for a walk down Main Street in my own Deep River. Our downtown is becoming so charming. Deep River is really becoming the Queen of the Valley again. Approaching our library, I noticed a man sitting in the sunshine on the stone wall in front of it. Right across from his gleaming parked Saab. His tee-shirt said Newport. He was working a laptop. A tourist, I was sure. Again, I just knew–he was taking advantage of the free Internet. He had searched out our library to do this and was delighted to find it. Wi-fi has become commonplace. When you buy that service, often you use a password to access it. Some people don’t bother. People like the three I have mentioned often troll for an un-protected service. Sometimes they troll their neighbors do. Their computers indicate who is using wi-fi within a certain range, and what the relative strengths of the signals are. This way they get wi-fi free if they do sneak into somebody’s service. It doesn’t seem to be illegal. I have come to believe that public libraries make the conscious decision to leave their wi-fi available this way. For anybody and everybody who wants it, even from outside. For them it’s just another way to serve the public. Libraries, how wonderful. Few other countries approach us in the quality of their libraries. Take it from me. I’ve been to many. How lucky we are. I remember the first time I used a public computer in a public library outside the U.S. I was up in Quebec City. I discovered the big, splendid new library there. Ultra-modern in every way, including its architecture. I saw many public computers in one room. Many people using them. As it turns out, while I was in Ukraine I read that the Bill and Melinda Gates Foundation was making a grant of millions of dollars for many libraries throughout the country over a period of years. Yes, to make the marvels of the Internet available to Ukrainians. I believe the first company to make wi-fi available to its customers was Starbucks. Starbucks was already providing free newspapers for customers to enjoy with their coffee. Free wi-fi was the logical next step. Back from Ukraine, I made a happy discovery. Guess what? McDonald’s now provides free wi-fi in more than 12,000 restaurants in the U.S.
No wonder it’s the industry leader. I have enjoyed McDonald’s and Burger King for coffee and a pit stop for years. But I haven’t yet been in a Burger King with wi-fi. I am sure they will make the big leap. Will have to. Public free wi-fi has become a standard amenity in many places. Hotels, shopping centers, airports, universities, hospitals, resorts, book stores, brake and oil lube shops, on and on. This is when I discovered the new tiny enetbooks. First came the laptop, then he notebook, now the enetbook…each one smaller. Had to have one. Bought a beauty. Has the standard software programs plus many bells and whistles. Even a tiny video camera (but I don’t use it…don’t want people to see what I really look like at times). Weighs less than two pounds. Has everything except CD and DVD capability. But I don’t need these because I also own a Mac. For nearly five years now–since the first week it appeared on the market–I have owned an Apple MacMini. It’s a full desktop processor. Just the size of a cigar box, if you are of age to know what that is. Cigar boxes are not common any more. My MacMini is full-powered…mighty! I even took it to Ukraine with me, but it was months before I found a place to live with where I could connect it. Well, got to tell you that on my long zigzag journey home from California, where I arrived from Ukraine, I used my wonderful enetbook every day here and there…all kinds of places. All because of free wi-fi. Hard for me to believe that I have been using computers for more than 40 years. I remember when all of us on the editorial side of the Worcester Telegram & Gazette received a memo from upstairs. It said all of us would get computers and we would have to learn to use them. Mandatory. “We will train you. Don’t worry!” The idea was frightening. I remember my first portable computer. It was a Smith-Corona. Laptops had not yet appeared. I used it at home and on the road. A bulky thing. It weighed 10 times as much as my little e-book. Nevertheless, marvelous. I remember the first time I walked into a public library with it. I walked it with an extension cord in my other hand. I approached a librarian at her desk. “May I use this?” I said, and explained. I set up at a table and went to work. She kept glancing at me. Finally she came and stood at my side and looked on. “That is very nice, isn’t it!” she said approvingly. How right I was. That Smith-Corona of mine has become an antique. And know what? Just yesterday I read in a newspaper—a digital newspaper, by the way, like this one you are reading—that the huge outdoor National Mall in Washington has been equipped with wi-fi. More than 200 “hot spots” have been set up on its vast acreage. They disperse the wi-fi signal. Yes, right there in front of our Capitol. People out there in the fresh air will be able to open their computers and connect to the world. Without wires! But not only laptops and enetbooks now. With Blackberries and their kind. With the so-called smart telephones of many kinds. Millions now own one. Even the three oldest of my five grandchildren—the other two are less than four years old! All three are texting. That’s a brand-new word to me—typing with two fingers on the tiniest of electronic keyboards, sacrificing grammar and spelling to brevity and expediency. Maybe to you also. I don’t now how to text. That’s too newfangled for me. All this is the fantastic result of the first half century of this, our civilization-changing Computer Age. And this is just the beginning. I see the certainty—though I may not live to enjoy it—that entire towns and cities will have free wi-fi. In fact, our whole country will have free wi-fi. Someday the whole world. This I believe truly. Having a computer device to connect to it will be as basic and commonplace as wearing shoes. I remember reading Buck Rogers comics when I was a kid. Buck Rogers was far-fetched and wonderful. But even Buck Rogers was not futuristic enough to keep up with this! John Guy LaPlante is a veteran writer, journalist and resident of Deep River. His award-winning columns and articles were most recently published in the Main Street News. He is the author of two books, “Around the World at 75. Alone! Dammit!” and “Asia in 80 Days. Oops, 83! Dammit!” He has just completed his service as a Peace Corps Volunteer (PCV) in the Ukraine where his 27-month tour of duty began last fall. John always welcomes comments on his articles. 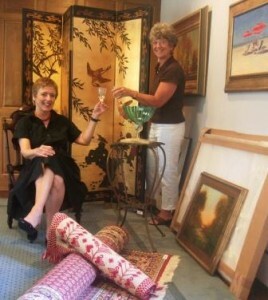 The Merchants of Chester will again celebrate the arrival of autumn with the 20th annual Come Home to Chester Days, a weekend of art gallery, shop and restaurant opening receptions in Chester Center on Friday, September 17, 2010 from 5:00 p.m. to 8:00 p.m. and exciting events on Saturday, September 18, 2010. “Every September, we keep our doors open late on the Friday night closest to the Autumnal Equinox to celebrate the beginning of fall. 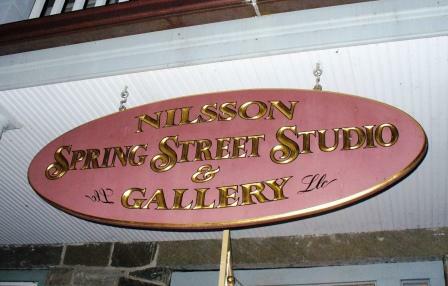 We have receptions in our galleries, shops, studios, and restaurants,” says Leif Nilsson, artist and owner of the Leif Nilsson Spring Street Studio and Gallery. 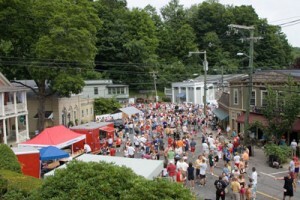 “It is a festive evening when townspeople and visitors are invited to stroll the streets of an antique New England village; to see the latest paintings, photographs, sculptures, fashion and jewelry; to sample baked goods and fine food; and to discover handcrafted decorative accessories and furnishings.” Most everything is within walking distance from the Maple Street and Water Street parking lots. Chester, Connecticut is a unique town known for celebrating art, history, music, fashion, theatre, craft, cuisine & conversation in the magnificent Connecticut River Valley. The town is renowned for its quaint shops, artist galleries, and a variety of fantastic restaurants that all family members can enjoy. Easy to reach by car, rail, air, or boat, a convenient two-hour drive from NYC and Boston, MA, Chester is located at exit 6 on RT 9, between I-95 and I-91. For general information about the event, contact Leif Nilsson at 860-526-2077. 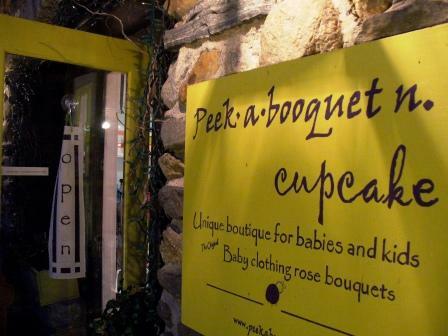 For specific information about particular merchants, call them directly, visit their websites, or consult www.VisitChesterct.com, which has a continually updated listing of the town’s weekend and special events. The following will be open Friday evening from 5 p.m – 8 p.m. on September 17, 2010 unless otherwise noted. Photographer Caryn B. Davis will exhibit photographs from her travels. For more information contact Caryn B Davis at 860-526-5936, through email at caryn@cbdphotography.com or visit her website at www.cbdphotography.com. The Artisans will be featuring Roger Landry September 1 – 30 with his acrylic paintings. The Art Gallery at The Mill House exhibitors for September 1 – 30 are the 9 Odyssey Painters. They are: Pat Barone of Clinton, Phyllis Bevington of Chester, Christine Danilowicz of Branford, Gail Estrade of East Lyme, Karen Lipeika of Deep River, Brenda Newbegin of Essex, Carol Robertson of Old Saybrook, Paula Solimene Emery of Killingworth and Maureen Tarbox of East Haddam. Their Reception is Saturday, September 4: 2-5pm. The Public is welcome!! Artist Patrice M. Nelson is thrilled to be part of the downtown village and brings her colorful whimsical artwork to Chester! Join the festivities September 17th during the “Come Home to Chester” fanfare with a cheer and a toast to her new UPBEAT STUDIO. 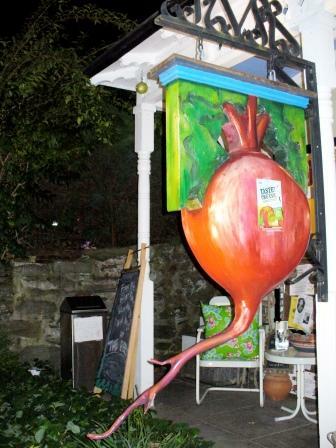 Located right above The Local Beet. 18 Main Street 5-8pm. For information call 860 575-0145 or email at meohmy@comcast.net. Celebrating the cooling nights of Fall until 8 pm on September 17th..
Stop in for a healthy treat and a chance to win our Peter Good original Beet T-shirt. Healthy foods to feed your family and nurture yourself. Vitamins, Supplements, Natural Remedies, Teas and more than 60 bulk items to scoop. Open house hours on Friday are 5-8 pm. Saturday 10-6, and Sunday 9-3 pm. We will be having a Sale Friday Sept. 17 thru Sunday Sept. 19 on finished jewelry,eclectic oddities, books, metalsmithing tools, jewelry supplies, glassware, and plenty more! Enjoy herbal iced tea and make a donation to the Chester Rotary Polio Fund all weekend while you shop! Halloween is right around the corner. Come by to start your costume with one of our Fair Trade costume hats, masks, or one of our own one-of-a-kind hand decorated masks! Come let us inspire Your Imagination! Contact Kathryne Wright at 860-526-1654. The Art Gallery at The Mill House exhibitors for September 1 – 29 are the 9 Odyssey Painters. They are: Pat Barone of Clinton, Phyllis Bevington of Chester, Christine Danilowicz of Branford, Gail Estrade of East Lyme, Karen Lipeika of Deep River, Brenda Newbegin of Essex, Carol Robertson of Old Saybrook, Paula Solimene Emery of Madison and Maureen Tarbox of East Haddam. Their Reception is Saturday, September 4: 2-5pm. Their second reception will be part of “Come Home to Chester” night September 17, 2010 from 5-8 pm.The Public is welcome!! 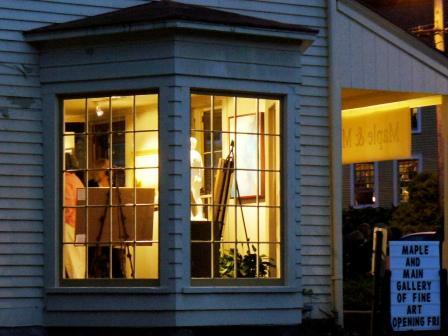 Please join us for a Sneak-Peek opening of Chester’s newest art gallery, Maple and Main Gallery of Fine Art. 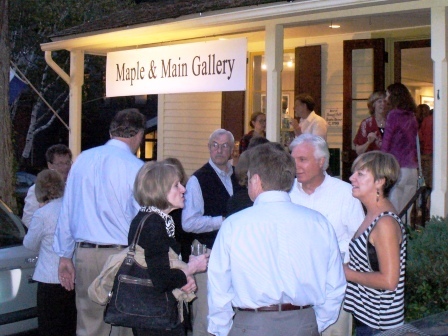 At Maple and Main you will find investment quality art by local, regional and nationally known artists. Our artists bring to you a diverse mix of mediums and styles ranging from traditional realism to mixed media. You will experience the finest art Connecticut has to offer whether you’re looking for portraits, traditional and plein air landscapes, seascapes, marine art, figurative works or still life. Housed in a charming building built by Samuel Colt and Pardon Stevens in 1798 which uses four tall ship masts as support beams, Maple and Main, located right in the heart of Chester Village, brims with both New England charm and stunning art work. Please join us Friday evening, September 17th, to kick off “Come Home to Chester Days” weekend. Light refreshments will be served from 5-8 PM. You’ll enjoy perusing our excellent selection of antiques, hand-knotted Persian rugs and quality estate pieces. 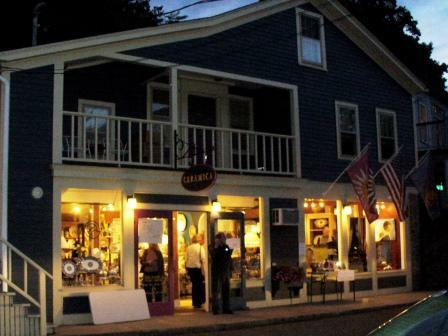 We also offer vintage and antique jewelry along with original, handmade designs by CT artisans for your enjoyment. Our handmade goat milk soap has become one of our best selling items throughout the year. You will not be disappointed in our collection of original art, featuring the outstanding work of watercolorist Pat Kelbaugh and Chester artist Alan Schweitzer, whose stunning mosaics are creating a lot of excitement this year at Mystic Sisters. Jan’s finds for Fall are arriving daily in our first floor shop, including some unique jackets, shirts and hats for men. Come find what you didn’t even know you were looking for! And then come upstairs to our new 2nd floor gallery. Opened in June, our 2nd floor gallery space showcases a poster collection representing 40 years of Cummings & Good internationally acclaimed graphics, original art, archival print editions and note cards. Also available by special order are custom decorative marble tiles by Au Grenier Doré. On Saturday, Sept. 18, the Chester Historical Society and Chester Land Trust are coming together to present a Celebration of Barns program followed by a Harvest Potluck Supper. Starting at 3 p.m., Chester’s Scouts will raise a small post and beam structure on the town green (or indoors, in case of rain). Everyone is invited to watch and participate. There will be sheep on the green and carding and spinning wool will be demonstrated. At 4 p.m., architectural historian Todd Levine will talk about the history of barn types in Connecticut, and Billy Cadley, a local post and beam barn builder, will talk. At the conclusion of the barn program, the tables will be arranged for the potluck Harvest Supper. Bring a dish to share from your garden or a dessert or meat course to share. Also bring your own beverages and service. The event is free and open to the public. For more information, go to www.ChesterHistoricalSociety.org or call 860-526-2331. Join us in celebrating Chester’s past and present. ESSEX— A total of 13 people have applied for the job of zoning enforcement officer, a position that has been vacant since May. Maria Lucarelli , assistant to the board of selectmen, said Monday 13 applications were received by an end-of-August deadline. Lucarelli said a selection committee, including members of the zoning and inland-wetlands commissions, along with Selectman Joel Marzi, is expected to meet this week to pick five finalists for possible interviews. The zoning enforcement officer job, which also includes enforcement duties for the inland-wetlands commission, has been vacant since the departure of Deep River resident Marian Staye from the position in mid-May. Staye, who held the job for nearly eight uyears, has been working part-time in the position at least one day each week during the interim period. In late July, the board of selectmen accepted a recommendation from the selection committee and offered the job to Robert Flanagan, a Thomaston resident who was working as zoning enforcement officer in Redding. After a final intwerview with the selectmen, Flanagan declined to accept the job offer. Cappella Cantorum’s non-auditioned registration/rehearsal for Haydn’s “PAUKENMESSE” will take place Monday, Sept. 20, 7 p.m. at John Winthrop Middle School, Route 80 (Exit 5 off Route 9) in Deep River. Soloists and Ensemble will be auditioned from the group. Rehearsals are Mondays at 7:30 p.m. at John Winthrop Middle School. Registration fee is $40; music costs $29.80 or $5.80. High school students are free. Concert dates are Saturday, Dec. 4, at 8 p.m. and Sunday, Dec. 5, at 3 p.m. at St. Mark R.C.Church, Westbrook. For more information call Barry Asch at (860) 388-2871. Local conservation groups are inviting amateur photographers to focus on the celebrated and scenic countryside of Lyme, Old Lyme, Essex, Salem, and East Haddam and submit their photos to the Sixth Annual Amateur Photo Contest. The Conservation/Land Trusts from each of those towns are sponsoring the contest. All amateur photographers are welcome to enter the contest regardless of what town they reside in. This contest is being funded with the generous support of Lorensen Toyota, Oakley/Wing Group at Smith Barney, Evan Griswold at Coldwell Banker, Ballek Garden Center, Essex Savings, Bank, Murtha Cullina LLP and ChelseaGroton Bank. In addition to the above noted prizes, a special $100 award will be given in memory of our former judge, John G. Mitchell, for the best photograph that promotes and supports our environment and biodiversity. “As a former editor at National Geographic, John dedicated his career to writing about the environment and conservation and so the award is for the best picture reflecting that subject” explained Tony Sullivan, the conservation trusts’ spokesperson. “We are delighted by the caliber of the judges we have been able to attract for this year’s contest,” said Sullivan. The three independent judges are William Burt, a naturalist who has won acclaim for his books of wildlife photography: Rare and Elusive Birds of North America, Shadowbirds, and his recently released Marshes: The Disappearing Edens. Amy Kurtz Lansing, Curator at the Florence Griswold Museum and a Yale University doctoral candidate in the History of Art. She is also the author of Historical Fictions: Edward Lamson Henry’s Paintings of Past and Present. Rudy Wood-Muller, a photographic illustrator and designer. His first large exhibition was at the New York World’s Fair in 1964 and was followed by numerous other shows, including a one-man show at the Rochester Institute of Technology. A group of his photographs have been selected to be part of the Permanent Collection of the Metropolitan Museum of Art in New York. Gregory R. Shook, President & CEO of Essex Savings Bank has announced that non-profit community organizations will receive $99,298 from the Directors’ portion of the Bank’s Community Investment Program. The Bank annually commits 10% of its after tax net income to qualifying organizations. In April 2010, the Bank donated $74,700 to 89 non-profits who participated in the customer preference balloting at the Bank. By year end 2010, $248,700 will have been allocated to over 200 organizations bringing the total distribution since the inception of the program in 1996 to $2,917,000. To fund the Agency newsletter and Annual Report. – Frank DeLucia – Madison Community Services, Inc.
– Cathy McMahon – Madison Community Services, Inc.
– Margo Sweeney – Madison Community Services, Inc.
Essex Savings Bank is a FDIC insured, state chartered, mutual savings bank established in 1851. The Bank serves the Connecticut River Valley and Shoreline with five offices in Essex (2), Madison, Old Lyme and Old Saybrook. Financial, estate, insurance and retirement planning are offered throughout the state by the Bank’s Trust Department and subsidiary, Essex Financial Services, Inc, Member FINRA, SIPC. Investments in stocks, bonds, mutual funds and annuities are not FDIC insured, may lose value and are not a deposit, have no Bank guarantee and are not insured by any Federal Government Agency. The Pulitzer Prize-winning New York Times reporter Kate Zernike, author of Boiling Mad: inside Tea Party America, will be at the Essex Library on Thursday, Oct. 7, at 7 p.m.
As the 2010 midterm elections approach, the Tea Party has emerged as the wild-card player. Will its energy propel the Republicans in an electoral sweep, or has it actually complicated their efforts to take back their congressional majority? While many commentators have attempted to analyze this movement in one-off interviews and articles, Ms. Zernike has covered the movement from the beginning, and no one else has dug deep into the movement’s philosophical and cultural underpinnings. Books will be available for purchase and signing. Please call the Essex Library at 860-767-1560 for more information and to register for this informative evening.